Never underestimate the vital role hand washing plays in the spread of illness. Its importance was established in 1846 by a Hungarian doctor named Ignaz Semmelweis. At the time, many more women in maternity wards were dying of puerperal fever, also known as childbed fever, than women giving birth at home. Today, puerperal fever is defined as an infection of the genital tract following childbirth, characterized by severe pain, fever and, in serious cases, spread of the infection through the uterine wall or into the bloodstream. Semmelweis wondered why the death rate from puerperal fever was so high, so he studied two maternity wards in the Vienna, Austria, hospital where he worked, but drew no concrete conclusions. It wasn’t until he studied the death of a pathologist colleague from puerperal fever, contracted when the pathologist pricked his finger during the autopsy of a woman who died of puerperal fever, that Semmelweis discovered a link between the deaths. He hypothesized that cadaverous particles medical staff were getting on their hands from dissecting cadavers were making their way to the bodies of women during childbirth – all because staff weren’t washing their hands. His solution was ordering staff to clean their hands and instruments with soap and a chlorine solution. After implementing this technique, Semmelweis saw the death rate from puerperal fever fall dramatically. Unfortunately, Semmelweis’ discovery did not sit well with doctors, who felt it made it look like doctors were to blame for giving puerperal fever to the women. Doctors eventually gave up the chlorine hand washing technique. Semmelweis lost his job, was committed to a mental asylum in 1865 when he was 47 years old and died there, most likely of sepsis, a complication of an infection in the bloodstream – a condition similar to the puerperal fever he had studied so diligently years earlier. It took another 20 years after Semmelweis’ death for hand washing to take hold as a method to prevent the spread of illness. Wet your hands with clean, running water (warm or cold), turn off the tap and apply soap to hands. Lather your hands by rubbing them together with the soap. Lather the backs of your hands, between the fingers and under your nails. Don’t neglect your wrists. Scrub your hands for at least 20 seconds. To help make sure you hit 20 seconds, it’s helpful to hum the “Happy Birthday” song from beginning to end twice. Dry your hands with a clean towel or air dry them. If clean, running water isn’t available, use soap and whatever water is available. Alternatively, you can use an alcohol-based hand sanitizer that contains at least 60 percent alcohol. 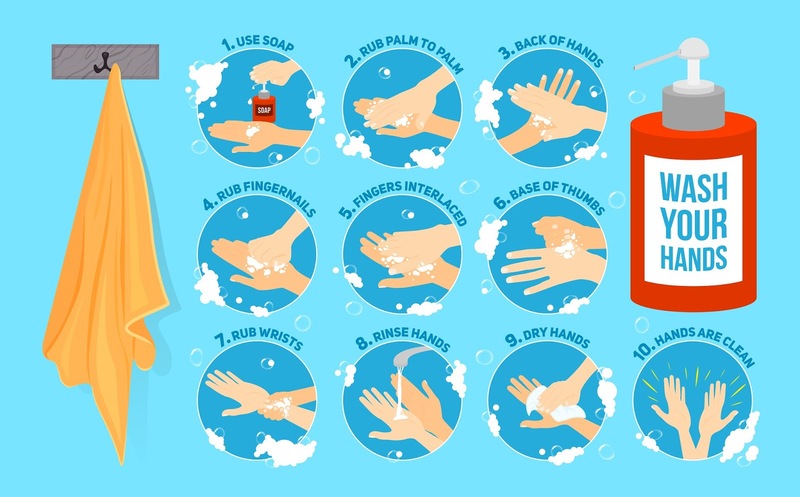 Apply the sanitizer to the palm of one hand, rub your hands together and rub the sanitizer over all surfaces of your hands and fingers until your hands are dry. Hand sanitizers do not eliminate all types of germs, however, and may be ineffective in removing harmful chemicals. Also, keep in mind that hand sanitizers are less effective on hands that are visibly dirty or greasy. Clean hands will help you avoid spreading germs to others. It’s quick, it’s simple and it keeps you healthy. Visit the CDC for more information about handwashing or the Louisiana Department of Health’s Fight the Flu to learn more about preventing the spread of flu.